Types of Fishing that the Bad Boyz II fishing crew offer you. 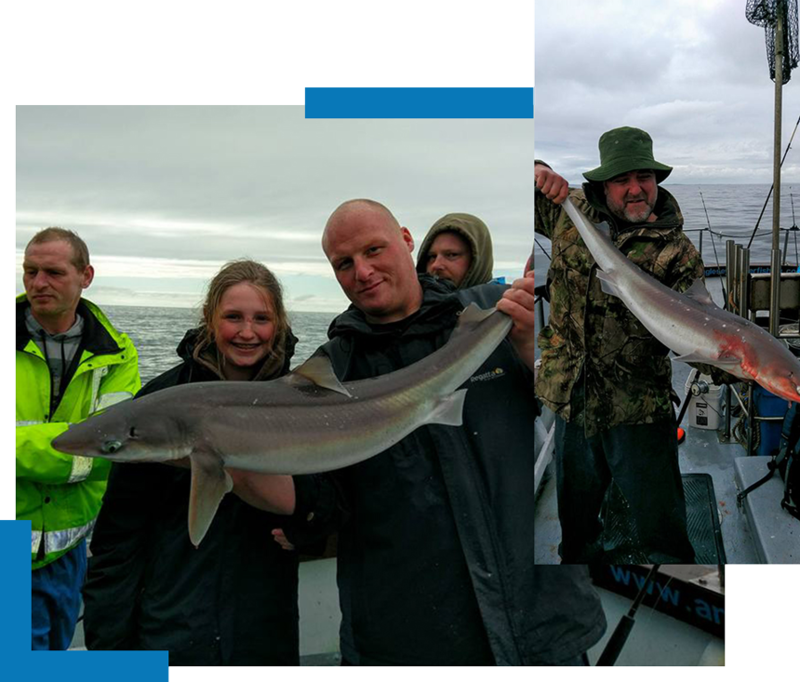 Tope to 72lb and Spurdog to 21 1/2lb are the boats records although 80+lb Tope do come from our coastline most seasons on neighbouring boats. Tope fishing from Holyhead varies depending on fishing areas and tidal size. We can fish the famous Holyhead Deeps on the lowest neaps to a maximum of around the 30/31ft on the inner edge, the neaps being our favourite due to the time we get at anchor is almost doubled. The Tope begin to show early may and continue to build in numbers through to mid October. Along with great sport on Tope there are plenty of smaller sharks in the form of Spurdog to be caught in the deep waters off our coastline providing excellent sport from as early on as March in large shoals running through the Summer and can often be a luck of the draw whether you lift your rod into a Tope or a Spurdog. The Spurdog gets its name from two bone spurs above each dorsal fin and white spots spread over its back making it easily identifiable against the Tope which bares a smooth back and light silvery grey colours. A slightly heavier uptider 6-10oz coupled with a 7000 / sl30 sized reel loaded up with 25 to 30lb breaking strain mainline, braid being the best choice. Rigs are nice and simple, for general a running ledger with 3-5ft 200lb mono-filament hook length and a 6-8/0 bronze hook for quick rust away if the trace if lost in the fish. We steer clear on wire traces due to the damage it could possibly do to the fish. ALL TOPE ARE CATCH AND RELEASE BASIS. When the large shoals of Spurdogs are around a heavy weight 2 hook paternoster made with 100/150lb mono and a couple of large red/lumi muppets will do the business for a quantity catch.